We are the closest Holiday Inn Hotel to the Disneyland Resort and a 15 minute walk to Downtown Disney and the park entrance at the only place the Monorail stops outside the park. Convenient resort transportation also provided by Anaheim Resort Transit (ART) at a nominal fee. Enjoy sunny Southern California beaches or world-class shopping, dining, and entertainment, all just minutes away. 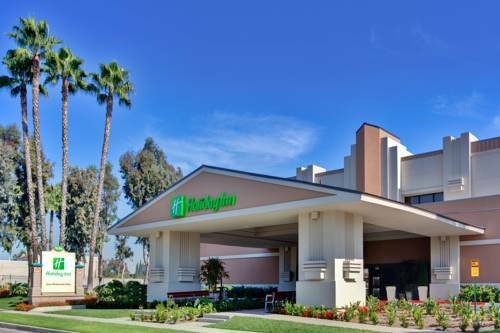 Located adjacent to Disneyland Park, Disney's California Adventure and close to many other popular attractions including Knott's Berry Farm, Universal Studios, Angel Stadium, Honda Center, South Coast Plaza, Fashion Island, The BLOCK at Orange, Staples Center, Dodger Stadium, and StubHub Center. Stay connected with Complimentary Wireless High-Speed Internet Access. We also offer a well-appointed Business Center and 3,400 sq ft of meeting space that can accommodate up to 350 people. Soak up the California sunshine in our new Splash Zone water playground with several water features including water cannons, Gus the Gator, Jeremiah the Bullfrog, giant flowers, ground jets, and a towering helicopter. Take a dip in the heated Outdoor Pool, relax in the soothing Whirlpool, or recharge in the 24-hour Fitness Center. Don't forget to treat your taste buds to delectable meals, refreshing slushies, and cocktails at our full-service Onyx Restaurant and Bar. See your favorite sports, chat with friends and sip your favorite cocktail as you unwind at the trendy inviting Onyx Bar. Enjoy our happy hour specials, 4p-7p daily. Meritage is 1890 sq feet of meeting space set to your preferred style. Rated "Best value in Orange County" by the Orange County Golf Guide, this beautifully maintained facility was designed to reward players of every level. Brimming with charm and challenges, this will be a memorable experience for every golfer. The Happiest Place on Earth is a short walk from our front door.